Welcome to Saint William Laud Episcopal Church, a witness to the love of Christ in the community of Pittsburg, Texas since 1954. Whatever your church affiliation may be, all baptized Christians, including children of all ages, are welcome to receive Holy Communion. If you are affiliated with another denomination and are a baptized Christian; and are accustomed to receiving communion in your own church; and you anticipate the real spiritual benefit and presence of Christ in the consecrated bread and wine, then you are welcome to receive at the altar. St William Laud is one parish among the 74 parishes that make up the Diocese of Dallas. You can learn more about the Diocese by going to the diocesan website. 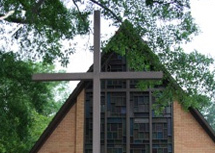 Meet StaffFind out all about William Laud Episcopal Church, it's clergy, and staff. We have a rich history, and a vibrant team of people who make a difference. Come see a slideshow of our wonderful community, and get a glimpse of some of the many activities that take place at Saint William Laud.